I'm sharing one of my favorite tools from my parenting toolbox today: music. It seems fitting, as a music teacher, for me to use music all the time as a parent, but to be honest I don't use it as often as I'd like. 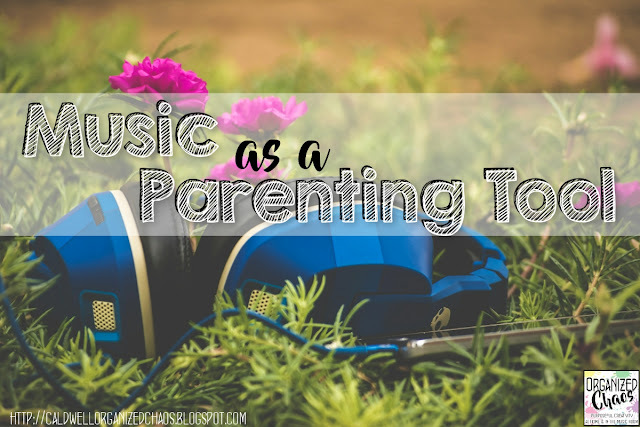 I have found music to be a great way to teach time management, deal with tantrums and arguments, ease morning wakeups, and spend quality time together as a family, so today I'm sharing how I use music as a parenting tool in all of these areas! One of the biggest causes of stress and arguments in our house is time management. I am that person who shows up early for everything because I hate to be late, but getting 2 preschoolers to get anywhere on time can be a serious challenge! I often end up standing over them, nagging them to hurry up, which doesn't help them AT ALL. The other time management issue that often comes up for us is ending a fun activity. When we're at the park, or even doing an especially fun activity at home, telling them that they have 2 minutes left and then they need to stop doesn't always help them emotionally prepare for leaving since they still don't have the best concept of time. The worst time for this? Bed time, of course! No matter how many warnings I give them of their approaching bed time, I am so often met with whining, pleading, and bargaining when bed time arrives. I have found music so effective for these situations! When we're trying to get ready to go somewhere, I turn on an upbeat song and tell them we have until the end of this song to get dressed. Then instead of us getting frustrated, we are all singing and smiling as we hurry to "beat the song"! The same thing works for ending an activity, including ending play time to go to bed. I turn on a familiar song and tell them that we are done at the end of the song. Now we are literally ending on a good note (ba dum ch!) and the kids can anticipate the ending time better because they know how the song goes and when the end of the song is approaching! I think this technique is probably most effective for toddlers, preschoolers, and maybe lower elementary age kids, but could be used with older kids as well depending on their personality. I find music a very effective tool to use when my kids are stuck in a bad mood or have painted themselves into a metaphorical corner with an argument and are feeling trapped. You know, those times when you know the only reason they're saying whatever ridiculous thing they're saying because they are cranky and/or don't want to admit they're wrong, but telling them that just makes it worse? I've heard before about using distraction in these situations, which works with really young toddlers, but the older they get the less likely they are to be happy about me pulling out a favorite toy or talking about an upcoming holiday, and the more likely they are to just dig in their heels even harder! With my daughters at least, music seems to be a good way to break the mood and give us all a chance to reset. I stop and tell them I am turning on a song. In this case, I usually turn on something calm but positive. Then we just sit and listen to the music. It gives us all a chance to have some space without sending anyone to time out. By the end of the song, usually everyone has had a chance to gather their thoughts so that we can have a more rational conversation about what happened. Of course, music is also just a great way to have fun together! It's easy to get caught up in the business of life and realize that we're all just running around completing tasks instead of enjoying each other's company. We sing songs together in the car, play instruments together at home, or have our own dance parties in our living room. Besides just being a good way to have fun in general, making and enjoying music together helps us build up a list of songs that we all know well, which I can then in turn use for other parenting situations I already mentioned! Do you use music as a parenting tool? I know I need to remember to use it more often at home- so often I look back and realize I could have handled a situation so much better if I had just turned on a song! I'd love to hear your ideas for using music as a parent- leave your thoughts in the comments. Want more? Click here to sign up for the Organized Chaos newsletter and get more ideas and resources for home and school sent straight to your inbox!